On a beautiful spring night such as this, the last thing I expected to come home to was another Scottie whodunnit mystery. 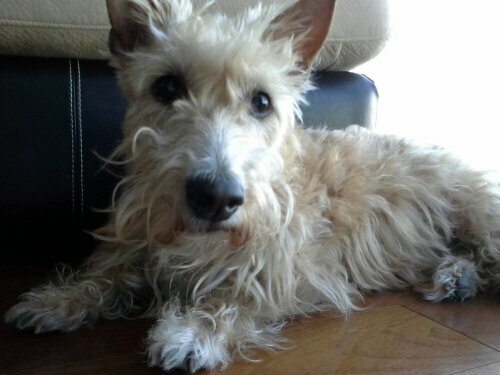 But as we Scottie Moms know, it is often when we least expect it when mischief strikes. Upon my return, I noticed Heather was overly happy albeit a little sheepish if you approached her - a clear sign she had been up to something. Mr. K, on the other hand, was acting just as guilty - a trait we have yet to decode as meaning, "guilty as charged" or the innocent bystander who hates being implicated in a crime he didn't commit. The real culprit, though, is not who you might think. In this case, Scottie Dad is to blame. You see, Scottie Dad will never learn: there is a rhyme and reason I keep certain items in certain places and it is best they are not messed with. 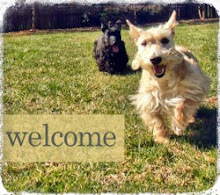 It only leads to trouble and a very unhappy Scottie Mom when he does. Heather and Mr. K, however, are more than delighted to be there when he forgets this important life Iesson and they are proud to demonstrate just how creative and mischievous Scotties can be...because, obviously, he forgot that, too. Earlier today, Scottie Dad made the mistake of moving a coveted bag of toys and treats Scottie Mom had hidden away from the fur kids with the intention to donate its contents to Atlanta Humane Society. In an effort to prompt Scottie Mom to take it sooner than later, he placed the bag in a more visible location, atop the TV stand. 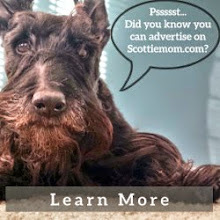 Sure, its new location may have appeared to the untrained eye to be out of a Scottie's reach but as any seasoned Scottie Mom knows, this is hardly a challenge for a Scottie and nothing is out of a Scottie's reach when treats are involved. The worst part is that the bag had been moved completely unbeknownst to me. I never took note of its new location and so, Heather and Mr. K were left alone for approximately three hours with the bag within their reach. Obviously, it doesn't take that long for a Scottie - especially a street smart one like Heather - to figure out where the treasure lies. You can pretty much imagine how this was a completely advantageous situation for the Scotties and you can bet they enjoyed every minute of it. Naturally, when we came home from dinner downtown, we came home to a disaster. Toys and wrappers covered the floor. My first reaction was, "what is all this? " and it was followed by immediate concern as to whether Mr. K found the small tennis balls designed for dogs much smaller than him. Luckily, the answer was no. My second concern was how much had Heather consumed. Unluckily, it seems as though she tore through two small snack packs of treats and may have taken a small of the plastic down with it. All was cleaned up in a matter of minutes and we are continuing to watch over Heather in particular as she is the one who is usually the treat thief and I can pretty much guarantee she was the first to catch Scottie Dad's error and take advantage of it. However, let this finally be a lesson learned by Scottie Dad: if you see random items stashed away from the pups, there is likely a reason for it and it may be in your best interest (and the Scotties') to leave it alone! What's the problem? I would have done the same. Smart little conniving doggies! Too smart for their own good. LOL, Scottie Dads never learn, do they? BOL!! I bet the treats tasted even better! All are innocent! Scottie Dad didn't know what was going on and dogs will do what dogs will do when it comes to food! Their heart was in the right place!